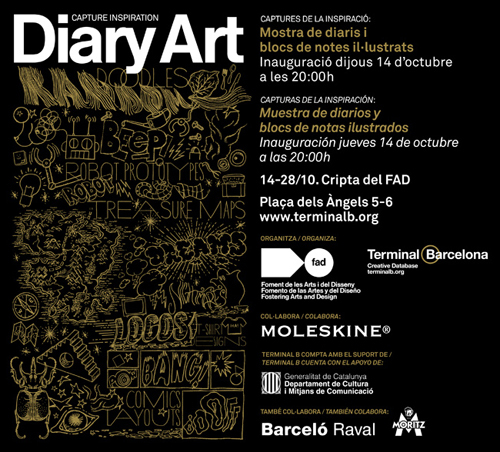 The Diary Art project – in collaboration with Moleskine – aims to bring visitors closer to a form of creation that, due to it’s intimate and personal character, is not usually visible to the public. The art of illustrated newspapers and notebooks. There are many artists (illustrators, designers, poets and creators in many other fields …) who always carry a small notebook to draw or write down that image, phrase or idea that assaults them at the moment of inspiration. Often the results obtained are much more than simple sketches; they are finished works, unique and unrepeatable, original pieces inserted in the object where they were created. With more than sixty guest creators, the event wants to vindicate the notebook as a full artistic support: portable and creative spaces for creation that allow creators to capture their inspiration, retaining the originality and spontaneity of the moment, wherever they may be.